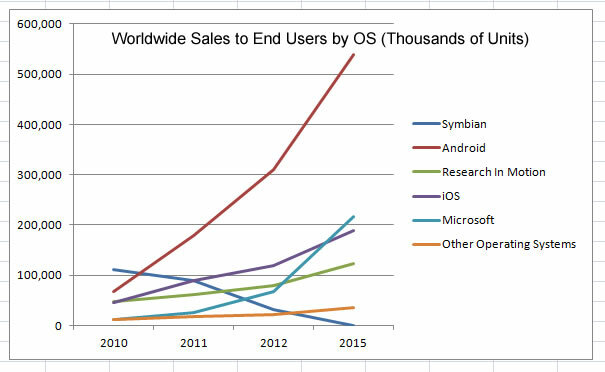 IOS, Blackberry, Symbian and Microsoft vs Android a fair fight? According to research firm Gartner, Android will become the number one operating system for newly purchased smart phones during 2011. At the same time the once dominant Symbian OS will slide into obscurity and the history books, as the next generation leave it behind, with handset manufacturers discarding it from their future plans. It is predicted (by ABI Research) that there will be over 2 billion mobile devices with HTML5 Browsers by 2016. HTML5 is revolutionizing iPhone, Android, Windows Mobile and Blackberry apps, with even the mighty Microsoft dropping Flash from their Windows 8 mobile OS in favour of HTML5. Generally Flash is being discarded from the plans of mobile OS architects, due to its heavy drain on processor cycles and hence battery life. HTML5 is capable of animations, drawing and video. Given the ability to allow HTML5 access to hardware accelerated effects, the standard will be increasingly capable of delivering smooth animations and video, with greatly reduced power drain. HTML5 has now become the only standard that can be implement consistently across different mobile operating systems. There are currently around 6,500 different models of mobile internet device, this includes the whole spectrum of mobile phones with internet access, smart phones, tablets etc. By 2015 it is expected just under half of new sales will be based on the Android OS, but perhaps more surprisingly, and thanks to the paring of Windows mobile with manufactures such as Nokia, it is currently forecast that Microsoft mobile OS sales will overtake those of Apple's mighty IOS.